If there is a type of property that identifies our real estate in Costa Blanca, these are our fantastic villas for sale Moraira. We recommend that you take a look at the entire range of villas that we have in this amazing city in the southeast of Spain. We offer more than 600 villas in Moraira. Thanks to our real estate agency has this important number of properties for sale in Moraira, customers can find the home in Spain that best suits their preferences. Similarly, it is logical to think that it can become more complicated to get the property right. Spanish Property Sales has a professional counseling department whose purpose is to help the client choose the best option for their well-being on the Costa Blanca. Our real estate agents will be in charge of helping the client at all times and collecting all their needs, after analyzing them. Once we know all the tastes of the future owner, we delimit the number of villas. In this way, we will provide the client with the best property for their rest and fun. So you can get an idea of ​​how you can enjoy our villas for sale Moraira, we provide the example of one of our exclusive villas in Moraira. It is a high standing villa, built in a sunny area with spectacular sea views. You can access the house from a pedestrian or automatic door. So that you do not have to be looking for more than one car park in the period of more influx of population, this villa has a garage with two parking spaces. The villa has an armored door, alarm system and video intercom. The property is composed, inside, of four rooms and four bathrooms. The villa has 300 m2 of living space, built on a plot of 1.300m2. The most characteristic area of ​​the exterior of the house is its garden, French style. The garden area surrounds the entire house and you can see fountains, statues, etc. This villa in Moraira has a modern pool and integrated Jacuzzi. An ideal way to relax after a hard and stress day. Do you want to know more about these kind of villas for sale Moraira? We will not make you wait long. Once we receive your email, we will instantly respond to it. If you call us, our professionals will attend you superbly and resolve all your doubts at once. 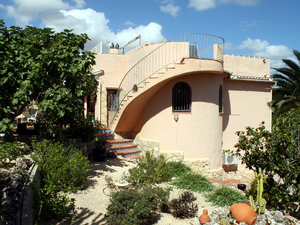 Remember that Spanish Property Sales is specialized in the sale of villas in Moraira. Do not look for more agencies and come to know ours. We are ready to fulfill your dreams.